Appeals Court Affirms State Gun Control Laws Passed After Sandy Hook Shooting : The Two-Way A federal appeals court has upheld the main parts of gun control laws in Connecticut and New York that ban certain semiautomatic weapons and large-capacity magazines. 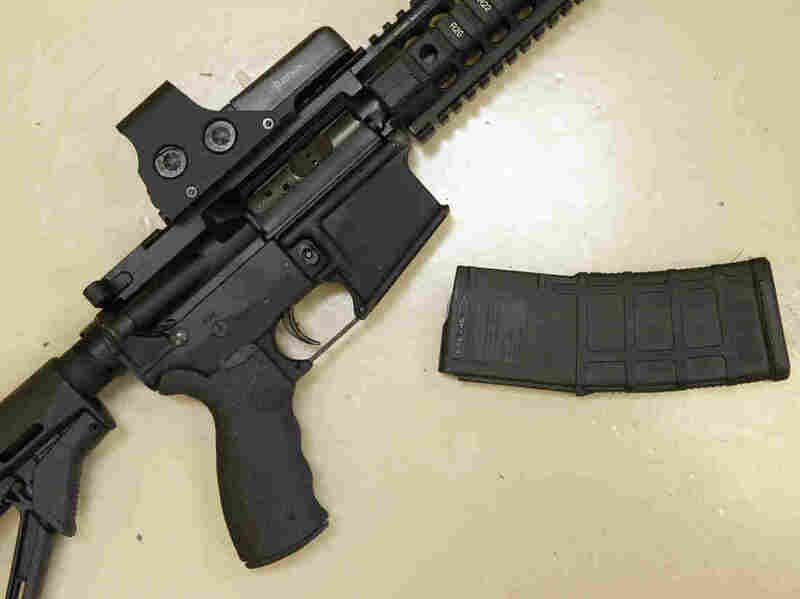 A federal appeals court upheld the core parts of gun control laws in New York and Connecticut that ban semiautomatic weapons and high-capacity magazines. The 2nd U.S. Circuit Court of Appeals has upheld the main parts of gun control laws passed in New York and Connecticut after the 2012 mass shooting at Sandy Hook Elementary School in Newtown, Conn. The laws ban certain semiautomatic weapons and high-capacity magazines. "This case validates a simple, fundamental truth about gun control: that it is possible to have strong laws that keep our communities safe, while at the same time respecting the rights of law-abiding gun owners. New York has set the example – and it's far past time for Washington to follow suit and pass a sensible national gun control policy." "Today's decision acknowledges our state government's obligation to take every sensible step toward reducing gun violence. One thing remains clear: Connecticut would be better off if every state and the federal government enacted similar, sensible gun safety rules." "The laws were challenged by coalitions of gun owners, firearms dealers and gun rights advocates. They said the bans in New York and Connecticut violated Second Amendment rights. "But now a panel of three judges on the the 2nd U.S. Circuit Court of Appeals say they disagree. Their ruling says the core provisions of these laws do not violate the Second Amendment." The court did, however, find certain parts of the laws unconstitutional. The judges reversed New York's ban of magazines loaded with more than seven rounds of ammunition and Connecticut's ban of the non-semiautomatic Remington 7615. Hansi adds that the plaintiffs plan to appeal the ruling to the nation's highest court. "We have said from day one that this case is on the way to the Supreme Court," Thomas King, president of the New York State Rifle & Pistol Association told Hansi. New York and Connecticut's new gun control laws are some of the toughest in the country, along with those in California, Maryland, New Jersey and Massachusetts, according to the Brady Campaign to prevent gun violence.